ESA has signed the Miravi upgrade contract. 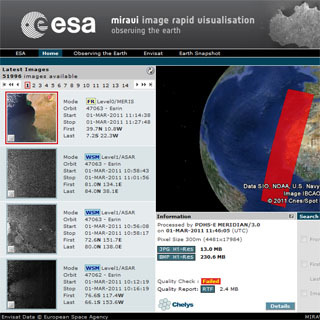 The new version, installed 28 February 2011, now includes support for processing ASAR Level1 products as well as a renewed MERIS Level0 processor, which has improved geolocation accuracy that reaches sub-pixel resolution. The Miravi web interface has also been redesigned, and now offers support for the Google Earth browser plugin. The performance is still first rate: between 4 and 20 seconds for generating an ASAR image.